I love Trader Joe’s. I can find so many tasty and healthy items at such great prices. They are certainly my go to store when I need to make something super quick and not feel quite so guilty about it. The frozen foods section has great meals when I don’t even have time to make something quickly, rather I only have time to throw something in the microwave or toaster. This meal is something I can ‘claim’ that I have prepared, yet it is super simple. 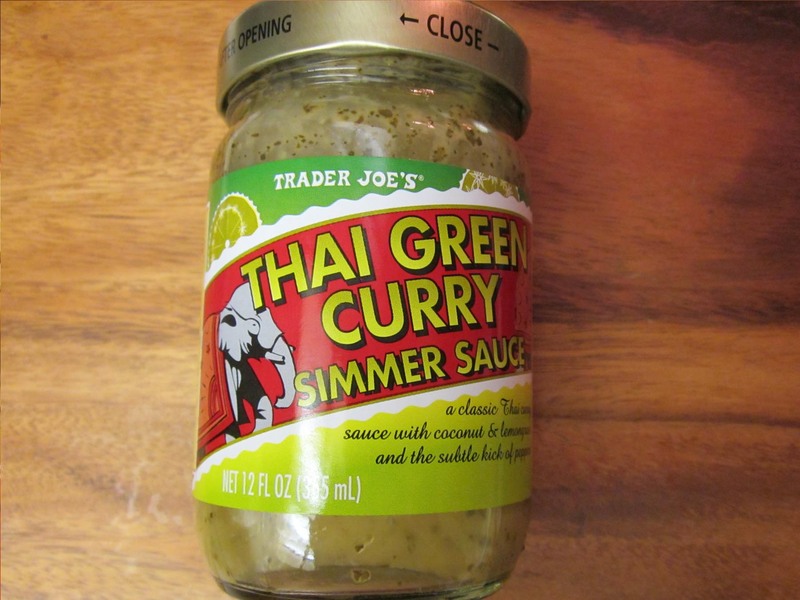 I have used Trader Joe’s Thai Green Curry Simmer Sauce as a topper for roasted vegetables. The green curry sauce has great flavors such as: coconut, lemongrass, cilantro, and peppers. You can use any vegetables you like, and you don’t really have to roast them. You could steam them… or you could pull a bag of frozen veggies out of the freezer and thaw them. I served mine over rice, but you could just serve the veggies on their own with the sauce, as a side dish. Keep in mind that this sauce is a little spicy. I am a bit of a wimp when it comes to heat though, so If I can handle it, I think anyone could… except, maybe, for small children that don’t do spicy. 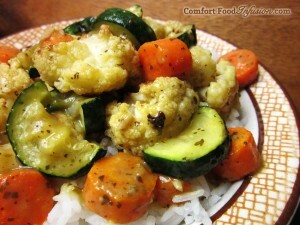 Roasted vegetables topped with Trader Joe's Thai Green Curry Simmer Sauce. Serve as a side dish, or on top of rice for a main meal. Swap out any veggies that you wish. Line a cookie sheet with tin foil. 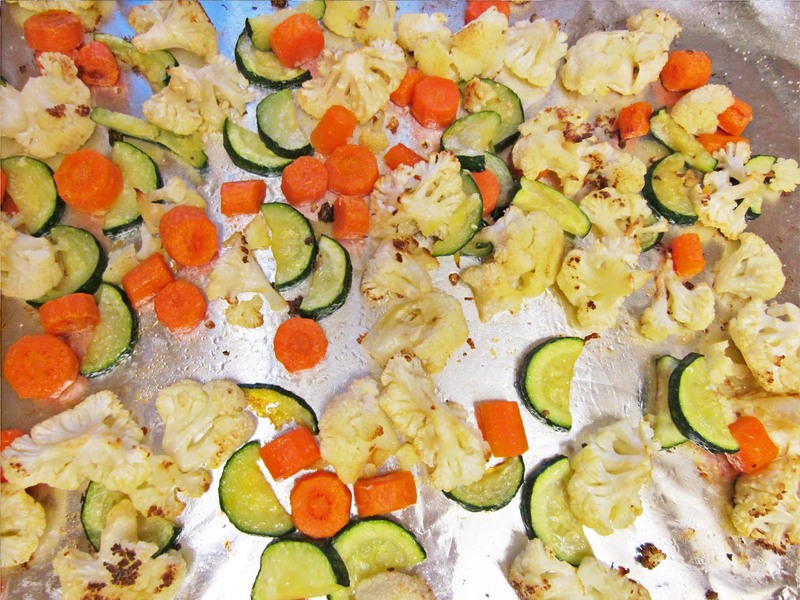 Place all vegetables on cookie sheet, drizzle with olive oil, and sprinkle with salt. With your hands, give them a good stir to coat all veggies with oil. Roast in oven for about 25 minutes, stirring once or twice during roasting. They will be done when edges of veggies begin to brown. As veggies are roasting, pour 6 oz. green curry sauce in a microwave safe bowl and heat for a minute or so, or until hot. Pour rice into one large bowl or several individual bowls. Top rice with roasted vegetables and top with heated green curry sauce. *Choose any vegetables that you wish. Roasting is not necessary. 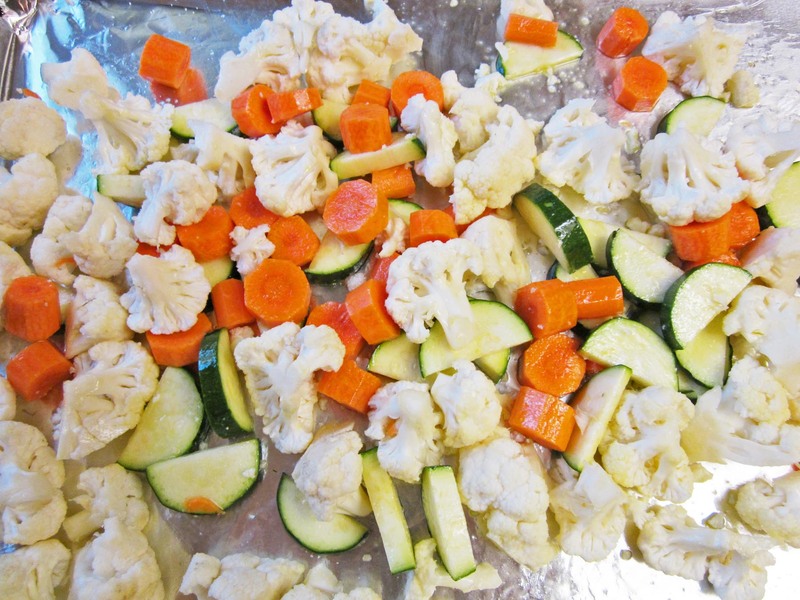 You can steam your veggies, or you can even use thawed/heated frozen vegetables.